Sidney’s Andre Gordon drives past Piqua’s Mick Karn during a Greater Western Ohio Conference American North Division game on Friday in Piqua. The Yellow Jackets were voted the No. 4 seed in the Dayton Div. I sectional. CENTERVILLE — A clear message was sent by Dayton-area Division I coaches during recent voting for sectional tournament seeds: losses to the likes of Cincinnati Moeller and Pickerington Central matter more than wins over the likes of Wapakoneta and Valley View. Though many Sidney (17-3) and Butler (18-2) fans were expecting their teams to be top seeds in the Dayton Div. I sectional, it was instead Greater Western Ohio Conference National East heavyweights Centerville (14-5) and Springfield (12-8) that were voted No. 1 and 2, respectively. The sectional’s seeds were revealed during its tournament draw meeting on Sunday at Centerville High School. Coaches across Southwest Ohio voted on seeds for teams in their sectionals last week and attended draw meetings on Sunday. Sidney, which is ranked No. 10 in Div. I in this week’s state Associated Press poll, is having its best season of the century thus far and is looking to make a district final appearance for the first time in 20 years. Sidney earned the No. 4 seed behind Centerville, Springfield and No. 3 Butler — which lost to the Yellow Jackets in overtime on Dec. 18 in Vandalia. 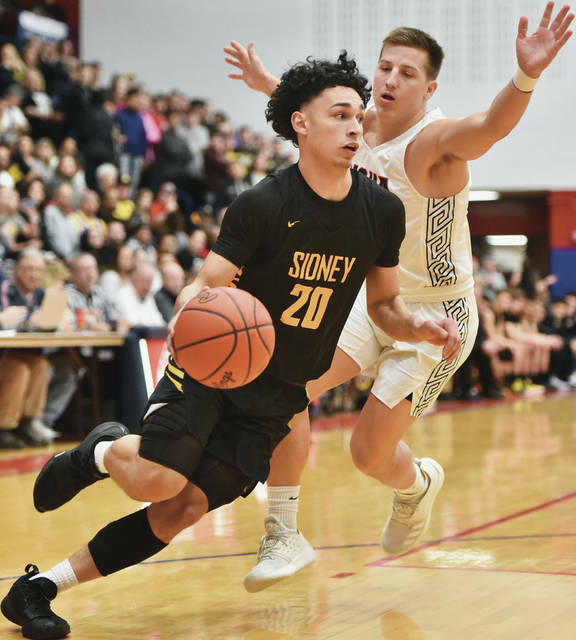 Close scores due to an inability to close out games, a loss at Fairborn and a weaker nonconference schedule when compared to Centerville and Springfield were likely factored by coaches and hurt Sidney’s prospects at a No. 1 or No. 2 seed. Though Centerville and Springfield have been shellacked some by out-of-area teams this year, their nonconference schedule feature heavyweights like state-ranked Moeller and Pickerington Central. Sidney, meanwhile, struggled to put the likes of Wapakoneta and Northmont away in nonconference victories. Though Sidney owned a head-to-head win over Butler (18-2), the Aviators’ superior overall record and the Yellow Jackets’ loss at Fairborn likely factored into the voting results. Butler beat Fairborn by 15 points two weeks prior to Sidney’s loss to the squad. Butler’s lackluster nonconference schedule (featuring teams like Versailles, Valley View and Springfield Shawnee) combined with its loss to Sidney likely contributed to coaches voting the squad third. There are three brackets in the Dayton Div. I sectional, and the winners of each will advance to a district final. Each bracket was already claimed by Centerville, Springfield and Butler by the time Sidney’s name was called. Willoughby weighed his options and placed the Yellow Jackets in Springfield’s bracket, which sets up a potential sectional final rematch. Springfield rallied and edged Sidney 63-62 in a sectional final last year. The Wildcats went on to win a district title before falling in a regional semifinal against Moeller. The Yellow Jackets will have their work cut out to reach a sectional final again. Sidney will open tournament play against No. 12 Dayton Carroll on Feb. 23. The Patriots (10-10) are coached by Tim Cogan, who guided Fairmont’s girls team to multiple Div. I final four appearances and a state title in 2013. Carroll has posted some impressive victories this season, including a road overtime win over No. 7 Miamisburg (14-5). If the Yellow Jackets beat Carroll, they would face the winner of No. 8 Fairborn (13-7) vs. No. 11 Springboro (8-12) in a second-round game on Feb. 28. Wins in both games would likely result in a sectional final rematch with Springfield, which will face No. 20 Tecumseh in the first round and would play No. 18 Troy in a second-round game. The sectional final is scheduled for March 2. All games in the bracket are scheduled to be played at Butler’s Student Activities Center. Sidney and Butler are among 10 schools leaving the GWOC to reform the Miami Valley League next year. Springfield and Centerville are among 10 that will remain in the GWOC — though the conference will be reduced to eight schools in 2020 after a departure by Lebanon and the removal of Trotwood-Madison. Jackson Center, Fort Loramie and Russia were voted the top three seeds, respectively, in the Piqua Div. IV sectional. The Tigers (15-4) opted to go in the sectional’s bottom bracket and will be paired against the Troy D-IV sectional’s top bracket in the district finals. That bracket features Metro Buckeye Conference power Xenia Legacy Christian (18-3). Fort Loramie went into the Piqua sectional’s top bracket and will be paired against the Cincinnati D-IV sectional’s top bracket in the district finals. That bracket features Cincinnati Christian (16-4). Russia (12-6) opted to go in the sectional’s bottom bracket. The Raiders, which split with Jackson Center in SCAL play this year, have lost to Fort Loramie in tournament games each of the last three years. Botkins (11-9) was voted the No. 4 seed and went into the top bracket. The Trojans beat Fort Loramie on a buzzer beater in January and will host the squad on Friday to close out SCAL play. Jackson Center will open tournament play against No. 12 Triad (0-21) on Feb. 23 and if victorious will advance to face No. 13 Bradford (0-19) on Feb. 28. Russia will open tournament play against No. 10 Mechanicsburg (8-10) and will face the winner of No. 6 Fairlawn (9-10) vs. No. 8 Lehman Catholic (7-11) in a second-round game on Feb. 28. The winner of the second-round game will likely face Jackson Center in a sectional final on March 2. Fort Loramie will open tournament play against No. 11 Covington (4-15) on Feb. 22 and if victorious will face No. 7 Riverside (7-11) in a second-round game on Feb. 26. The second-round winner will move on to a sectional final on March 1. Botkins will open tournament play against the winner of No. 5 Ansonia (12-8) and No. 7 Mississinawa Valley (9-11) on Feb. 26. The winner will advance to a sectional final on March 1. All games will be played at Piqua’s Garbry Gymnasium. Anna was rewarded for stellar regular season play with the Dayton Div. III sectional’s No. 1 seed. The Rockets (18-1), which are ranked No. 5 in this week’s state AP poll, will open tournament play on Feb. 23 against Carlisle (5-16) and if victorious will face No. 22 Springfield Northeastern (3-17). A win over Northeastern will put the Rockets in a sectional final against either No. 10 West Liberty-Salem (11-9), No. 11 Bethel (10-10) or No. 13 Preble Shawnee (9-10) on March 2. Versailles was voted the No. 7 seed and will open tournament play either No. 5 Twin Valley South (17-2) or No. 17 Greeneview (7-12) on Feb. 16. Houston (5-14) was voted the sectional’s No. 20 seed and will face No. 2 Dayton Stivers (15-4) in a first-round game on Feb. 23. All of Anna and Versailles’ sectional games will be played at Northmont’s Thunderdome while games in Houston’s bracket will be played at Vandalia-Butler’s Student Activities Center. Complete brackets for all area teams’ sectionals will be published in the Feb. 20 edition of the Sidney Daily News. They can also be found online at SWDAB.org.